But Washington's generous solar incentives are coming under scrutiny. It works out like this: The utility pays you for your share of the electricity produced, usually as a credit on your bill. In addition, Washington state gives utilities a tax break to incentivize green energy and the utility passes all of that through to its solar customers by sending out checks annually. Participating in a shared solar project doubles the incentive rate. Justin Holzgrove, a manager at Mason County Public Utility District #3, said the state subsidy is many multiples greater than the value the electricity generated. To illustrate, the incentive payment on a community solar project built from 'made in Washington' components equals $1.08/kWh versus the retail electricity rate payback, which varies by utility from about $0.04-0.08/kWh. "With community solar, the state production incentives that are available really make it lucrative to get into it," Holzgrove said. Depending on the structure of the project ownership, participants may also qualify for a federal income tax credit. Single mother Chris Anderson said she looked into adding some kind of renewable energy to her home in Shelton, Washington, but it was daunting. Then last year, the electric company in her area invited customers to invest in a shared solar array on the roof of the utility operations center. "This opportunity is easy. It's literally the easy button," Anderson said. "OK, here's the check, but I'm doing a good thing." Anderson is one of thousands of people around the Northwest who've bought shares in a community solar project developed either by their utility or a local non-profit. The project she and friends bought into is a rooftop array operated by Mason County PUD #3. Holzgrove said his utility and some others around the state actually had to turn people away. "We had twice as many people register for solar units as we had solar units available," Holzgrove said. "There was a lot of interest in this." "We estimated a three to four year payback period, which is fantastic," he added. "When you're looking at putting a rooftop solar system on your own home -- a private home -- you're looking at a 10 to 15 or maybe even a 20 year payback period depending on your site's location." This community solar project offered customers an unusual combination of low risk and high reward, plus none of the hassles of building or maintaining a residential solar array. Anderson plunked down $10,000, which got her about ten of the 266 panels in the Shelton community array. If Holzgrove's estimate is correct, Anderson will break even in 2019 and every bill credit after that for the 20 to 30 year life of the project will be gravy. The 75 kW shared solar array on the Shelton utility rooftop could power about seven typical homes. To put that in context, Mason County PUD #3 serves 33,000 total customers with 110 of its customers invested in the shared solar array. It's probably no coincidence there are more than 50 similar community solar projects registered in Washington state compared to just a handful in sunnier Oregon and Idaho, which have no state incentives for shared solar. Because the going rate for electricity is cheap in the Northwest, the pioneering shared solar projects in Oregon that rely on power revenue alone may never fully pay back their participants over the life of those projects. "This is not going to save them money, but is going to promote the use of emission-free energy production," Central Electric Cooperative Member Services Director Jeff Beaman said about the altruistic motives that would lead one of his members to participate. CEC dedicated the largest community solar project in Oregon in January on the outskirts of Bend. Of course, there is always a catch. You could say the program is now too popular in large parts of Washington. A surge in solar installations has pushed more than a dozen Washington utilities up to a cap on incentive payouts. Solar installer Jeremy Smithson, CEO of Puget Sound Solar in Seattle, supported a proposed overhaul of the incentives at the legislature -- raising the cap, but lowering the subsidy payments to future solar adopters. 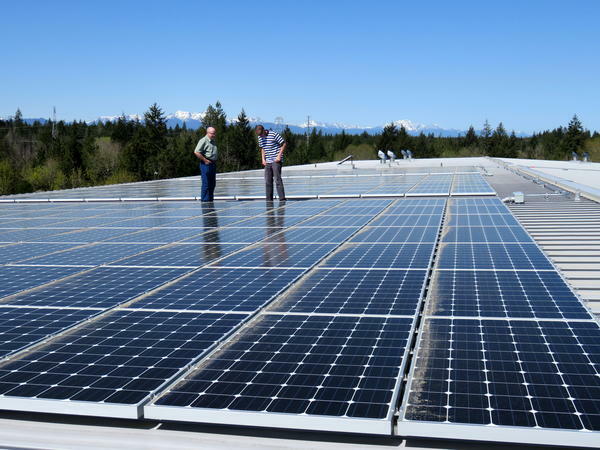 It didn't pass, so big Washington utilities such as Seattle City Light, Snohomish PUD, Puget Sound Energy and Clark Public Utilities are notifying solar array owners their annual incentive checks could be reduced because their programs are oversubscribed. "For most people it's just going to take longer for that project to pencil out," Smithson said. "We do have some people who took out loans and they were counting on the incentives to help them make the payments. Those people are probably the most concerned about the situation." For solar installers, Smithson said it means navigating "uncertainty" for the time being. He said falling prices for solar modules may offset the reduced incentives for new customers. "The effect for new customers is probably not as dramatic as it is for existing customers who maybe paid more for their projects," Smithson said. Separately, an analyst at the conservative-leaning Washington Policy Center criticizes the solar subsidies as an extremely expensive way to make the Northwest's already pretty clean power generation a tiny bit greener. "Despite Western Washington's status as one of the worst places in the United States for solar energy production, legislators continue to subsidize a technology that costs more and delivers less environmental benefit than virtually all other strategies," the think tank's environmental director Todd Myers wrote in a memo. Myers wrote in the follow up email that the state would get a far greater bang for the buck if it redirected its solar subsidy money to purchase reputable carbon offsets on the open market. Legislators appeared to ignore that critique in favor of spurring a local solar industry. Washington's solar incentives are currently scheduled to expire in 2020. In the most recent fiscal year ended last summer, the Washington State Department of Revenue said utilities were credited for nearly $7 million in renewable energy production incentive payments to customers, nearly all of which was for residential or community solar electricity generation. Solar Energy Surge in Washington Leads to Reduced Incentives <-- Listen at original site.